This is not named after the famous hit of 311’s Amber but Cherry Mobile got to tell you something about this phone. 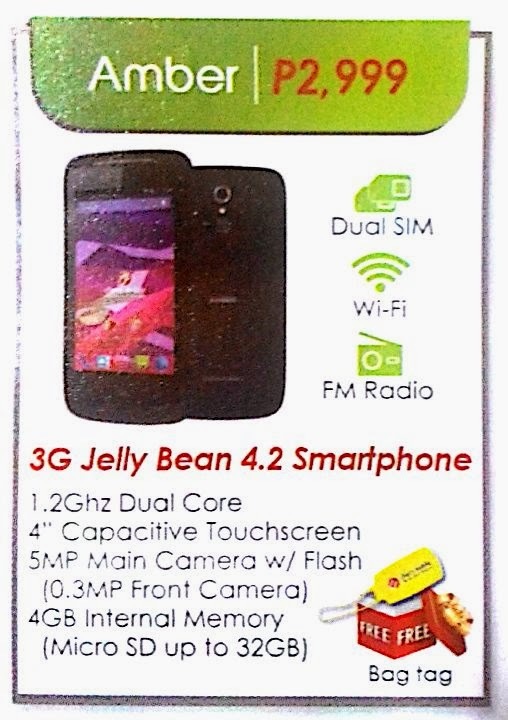 This is one of the phones available on their Christmas sale promo that last up December 30, 2013. All we can share from now is that it has 4 inch capacitive touch screen just like their famous Cherry Mobile Flare series. You gotta expect WVGA resolution on this device the same with one of their latest Android phone Life. This phone comes with a dual camera, 5 megapixels on rear side and VGA only front facing. It’s main cam has flash feature that can add quality shots in low light. You can also explore its basic camera mode to be more creative on taking pictures. Dual core processor handles all the tasks you throw on this phone so don’t expect more like a quad core phone has. Famous light games and other non heavy graphics needed apps will work fine just their how it works on Flare and Life. For storage, we can only share your its internal storage that has a capacity of 4GB and may cut down to a few amount due to system internals allocation. For file and storage, you can expand it up to 32GB using microSD for you photos, music and other important data. You can make use of network 3G signals on this phone for faster browsing and uploading when using the cellular internet. For those who have a wireless home network you can also connect on that as Amber also is Wi-Fi connectivity capable. Cherry Mobile Amber cost you 2999 pesos only that come with free bag tag if you manage you purchase this during the sale period. That’s all for now guys if happen to browse on this post you can hit or say anything using our comment box. how to manually configure its settings po sa globe tsaka smart?? hindi po kasi ako makaconnect via data lang eh..can u please help naman po..salamat..